Ohh I’m excited about this one. Baklava (not ‘balaclava’, as I keep wanting to call it) is a traditional Greek dessert made with filo pastry, honey and nuts. The only way to make baklava better? 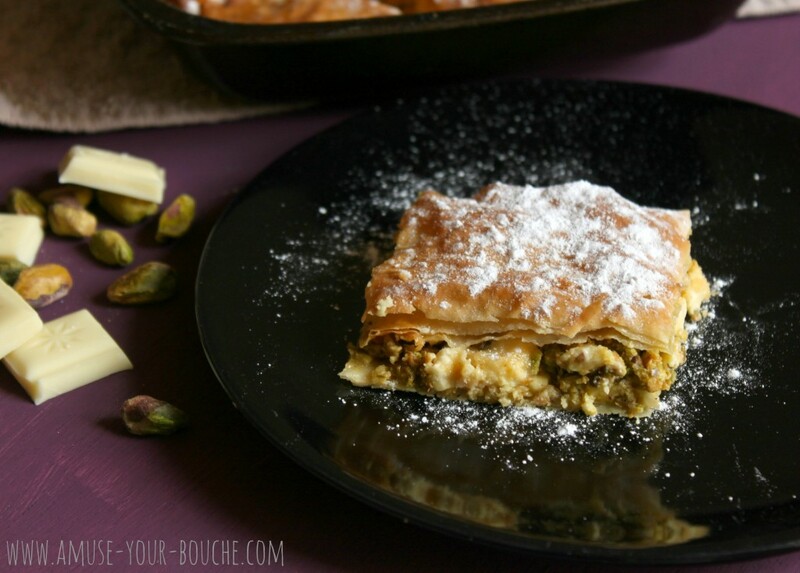 White chocolate and pistachio baklava. Yesiree. I guess I’ve simplified the traditional version, in that I’ve only used two layers of pastry with the filling in between, rather than having lots of layers (ain’t nobody got time for that), but since it tastes just as good and takes a fraction of the time, I think I should get away with it. I’m not really sure how to put into words how good this is. I’m not even a big nut lover, and I still loved this. ‘Loved’ as in, ate it all within about two days (and to be honest it would have been more like one day had it not been for the fact that I live with people who would have seen me). A minor word of warning: this stuff is pretty sweet (especially if you sprinkle it with even more sugar like I did) – so if you’re one of those (weird) people who likes their desserts to be ‘not too sweet’, you might want to adjust this one a bit. I don’t really get it, personally. Generally, I will always choose something savoury over something sweet, but if you are going to have a dessert, why not go the whole hog? I would quite happily eat several sugar cubes for dessert if it was more socially acceptable. So next time you need a dessert that only takes about fifteen minutes to put together, but is still pretty damn impressive (if I do say so myself), make white chocolate and pistachio baklava. You know it’s the right decision. Preheat the oven to 190°C (Gas Mark 5 / 375°F). Lightly grease a metal baking dish (I used 1 calorie spray oil, but if you prefer you can use melted butter throughout). Cut the filo sheets into rectangles that fit the dish (mine measured approximately 8 x 6 inches) – I ended up with 6 rectangles. Don’t use any less than this, but you can use a little extra if you like. Gently lay one sheet of filo in the bottom of the dish, and again spritz with oil. Repeat until you have used half of your filo sheets (so I used three sheets at this stage). Break the chocolate into small squares, and add it to a food processor along with the sugar. Pulse carefully until a coarse crumb is formed, then transfer to a bowl. Coarsely process the pistachios also, and add these to the bowl. Mix well. Spread the chocolate mixture in an even layer across the filo, and top with the remaining filo sheets, again spritzing lightly with oil between layers. Top with a slightly more generous amount of oil or butter. Cut the top layers of filo (down to the chocolate) to mark out portions – it’s easier to do this before the pastry has been cooked. Diamonds are traditional, but squares would be more practical. Bake for 15-20 minutes – keep an eye on it, because the filo will brown quickly so you might want to remove it from the oven before 20 minutes is up. Allow to cool for 5 minutes before slicing fully along the lines you created earlier, and serving warm or cold – top with icing sugar if desired. First time visiting your site.Nice collections of recipes.Thanks! Baklava is one of my all time favorite desserts!! White chocolate sounds like a wonderful additional ingredient! Your baclava looks absolutely tempting and delicious!